“Can't tell you how much watching Lute Olson every day helped me"
Coach Pastner understands the importance in giving back to the community. That’s why he is personally and actively involved with Wings Cancer Foundation Bet Against Breast Cancer, Make-A-Wish Foundation, the Ronald McDonald House of Memphis, and Le Bonheur and St. Jude Children’s Hospitals. 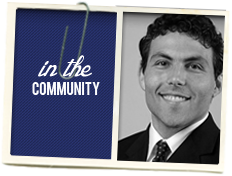 January 2013: Coach Pastner participated in the 2013 Infiniti Coaches’ Charity Challenge to help earn donations for Le Boehner Children’s Hospital. Congratulations to Coach Thad Matta of Ohio State! His $100,000 donation went to Ronald McDonald House Charities Central Ohio. University of Memphis Tigers Basketball Coach Josh Pastner recently visited Central High School to tape radio and television commercials promoting Memphis City Schools’ Universal Breakfast Program. Pastner and Dr. Vista Suarez (below), the Executive Director of the MCS Division of Nutrition Services, appeared in the commercials, along with several MCS students, to encourage students to eat the free, nutritious breakfasts that are offered at every Memphis City School, every school day. House Charities of Central Ohio. Spring 2011 He donated his lucky charm, his Fireworks of Hope tie, during the Tigers C-USA and NCAA tournament runs. All funds raised went to St. Jude Children’s Hospital.